Epic Esports Events released the Group Stage schedule of EPICENTER 2017, and announced the list of talent that will take part at the event. Yesterday, the groups of the best-of-three double-elimination Group Stage have been drawn. On October 23, FaZe Clan, TyLoo, Vega, and Liquid will battle in the Wild Card tournament to earn a place in the groups. Two of them will have to leave Yubileyny Sports Palace, in St. Petersburg, Russia before the start of the main event. The top two teams from each group will move to the best-of-three single-elimination Playoffs, while the Grand Final will feature a best-of-five battle. 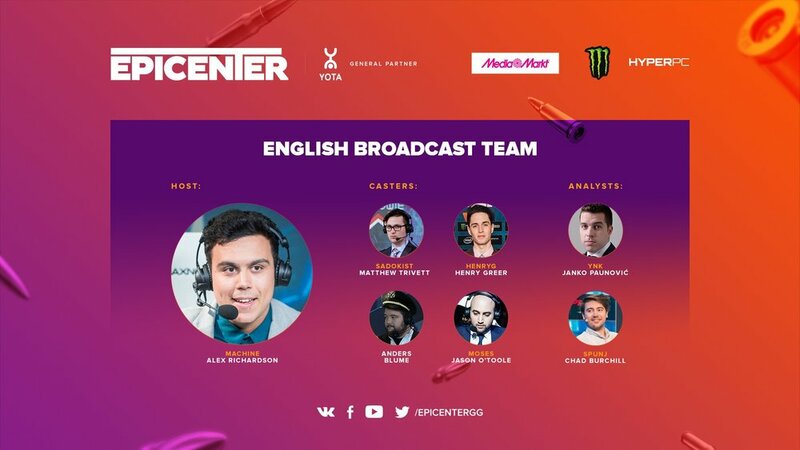 A total of seven experts of the scene will lead us during EPICENTER 2017. The role of host went to Alex "Machine" Richardson - in the past year, the charismatic Englishman hosted multiple events for ESL, DreamHack, and more. Two analysts and two duos of commentators finish the list. Team Liquid won the Americas closed qualifier for EPICENTER 2017 - Wild Card. They will battle against three more teams to participate in the $500,000 event. The 10th and final team for EPICENTER 2017 has been announced. TyLoo will participate in the Wild Card tournament as the Chinese representative. The groups and schedule for DreamHack Astro Open Denver 2017 have been released. The best-of-three matches for EPICENTER 2017 Wild Card qualifier have been revealed. Four teams will clash for two spots in the main event. The groups for EPICENTER 2017 have been revealed. Eight teams will fight during three days of Group Stage split into two groups.